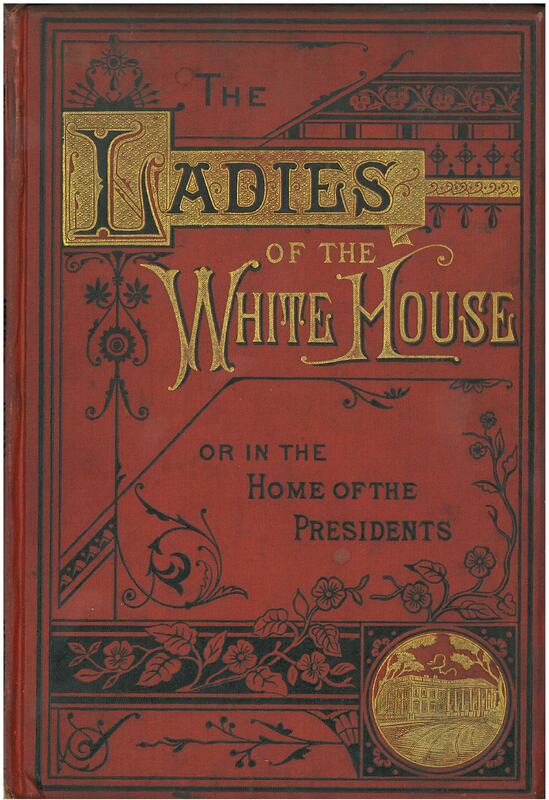 Yes, it’s Ladies of the White House; or, In the Home of the Presidents: Being a Complete History of the Social and Domestic Lives of the Presidents from Washington to Hayes – 1789-1880, by Laura C. Holloway. With Numerous engravings on Steel and Wood. (Cincinnati: Forshee & McMakin, 1880). Her memory is so fragrant with the perfume of purity and saintly sweetness, that it is a privilege to dwell and muse upon a theme so elevating. The world has not yet developed a more harmonious, refined, or superior type of womanhood than the daughters of Virginia in the last century. Reared in ease and plenty, taught the virtues that ennoble, and valuing their good name no less than prizing their family lineage, they were the most delightful specimens of womanhood ever extant. Most particularly was Martha Jefferson of this class, whose image is fast losing originality in the modern system of utilitarian education. Her father’s and her husband’s great enemy pronounced her “the sweetest woman in Virginia;” and the assurance comes laden with the testimony of many tongues, that her existence was one of genial sunshine and peace. Are not such natures doubly blessed, first, in the happiness they secure to themselves, and, secondly, in the blessing they are to those who walk in the light of their example? The Virginia and Carolinian especially were of direct descent from the “rufflers” of Hastings, and Templestowe, of Agincourt, and Rochelle. They were kindred too in more than pride and sentiment for the same English strain flowed in the veins of both, separating them from the Puritan English of the North, and warmed with the Huguenot flush and the dash of the Hibernian. Isn’t that delightful? I mean, it’s complete twaddle, but it’s deliciously twaddlesome. And Osterweis does in fact seem to rely on primary sources and has respectable footnotes, so I suspect that despite the occasional twaddly passage, the overall quality of the book is alright. So, romanticism > chivalry > jousting on the lawn at Monticello. See? We really can connect pretty much everything to Jefferson. That would be a great name for a band, wouldn’t it? Or a car. Alas, no, it’s my latest book acquisition, and although I do poke gentle fun at my Gilded Pig, it really is a great little find. I’ve been scouring the Internets for undiscovered works of genius by Marie Kimball, and came across a book she wrote – more of a pamphlet, really – called Treasured Recipes of the Old South (1941). There were plenty of copies to be had on used booksellers’ websites, but I wasn’t content with just any old copy. No! I bought a specially-bound presentation copy, produced for the author herself! And inside all the fancy leather cover with its gold-leaf trim and marbled endpapers is a 20-page recipe booklet, published by the Morrill Ham Company, with wall-to-wall Morrill Ham recipes. Ham cornucopias, anyone? It would be a mean person indeed who would mock such earnestness. Plus, it’s not just any old corporate-sponsored recipe booklet with scary pictures; it’s a corporate-sponsored recipe booklet with scary pictures, by Marie Kimball! And so we will treasure our new Gilded Pig, in all its amusing contrasts. A new intriguing book on the shelves: Impossible Engineering: Technology and Territoriality on the Canal du Midi, by Chandra Mukerji (Princeton, 2009). I have passed through the Canal from it’s entrance into the mediterranean at Cette to this place, and shall be immediately at Toulouse, in the whole 200 American miles, by water; having employed in examining all it’s details nine days, one of which was spent in making a tour of 40 miles on horseback, among the Montagnes noires, to see the manner in which water has been collected to supply the canal; the other eight on the canal itself. I dismounted my carriage from it’s wheels, placed it on the deck of a light bark, and was thus towed on the canal instead of the post road. That I might be perfectly master of all the delays necessary, I hired a bark to myself by the day, and have made from 20. to 35 miles a day, according to circumstances, always sleeping ashore. Of all the methods of travelling I have ever tried this is the pleasantest. I walk the greater part of the way along the banks of the canal, level, and lined with a double row of trees which furnish shade. When fatigued I take seat in my carriage where, as much at ease as if in my study, I read, write, or observe. My carriage being of glass all round, admits a full view of all the varying scenes thro’ which I am shifted, olives, figs, mulberries, vines, corn and pasture, villages and farms. I have had some days of superb weather, enjoying two parts of the Indian’s wish, cloudless skies and limpid waters: I have had another luxury which he could not wish, since we have driven him from the country of Mockingbirds, a double row of nightingales along the banks of the canal, in full song. The Canal du Midi is typically characterized as the achievement of Pierre-Paul Riquet, a tax farmer and entrepreneur for the canal. Yet Chandra Mukerji argues that it was a product of collective intelligence, depending on peasant women and artisans–unrecognized heirs to Roman traditions of engineering–who came to labor on the waterway in collaboration with military and academic supervisors. Ironically, while Louis XIV and his treasury minister Jean-Baptiste Colbert used propaganda to present France as a new Rome, the Canal du Midi was being constructed with unrecognized classical methods. Did Jefferson recognize the classical pedigree of the Canal du Midi? I’m not sure, but he was positively sloppy with adulation for the Pont du Gard and the Maison Carrée, so that aspect of the canal would surely have provoked a similar outburst of flowery language. As I believe I mentioned in a previous blog post, this fall will mark the 200th anniversary of Meriwether Lewis’s untimely and weird death on the Natchez Trace. To prepare for the momentous occasion, I felt the need to read up on the whole debate on the nature of his death: was it suicide, or murder, or something else? Since at work I have the attention span of a gnat, I am having to keep my background reading cursory, and so my program consists entirely of reading By His Own Hand? The Mysterious Death of Meriwether Lewis, ed. John D.W. Guice (University of Oklahoma Press, 2006). A few weeks ago I read the chapter on the case for suicide, after which I firmly believed Lewis killed himself; yesterday morning I read the chapter on the case for homicide. Unfortunately I have to say that I don’t think that this second chapter is as well-argued as the first, but after reading it I will say that I’m not prepared to entirely dismiss the possibility of homicide. Mostly because it seems a little hard to believe that someone could manage to shoot themselves twice with .69-caliber bullets, using a 14 1/2-inch-long pistol, then stagger around still alive for hours afterward. I’m just saying. Others are even more adamant in their skepticism about the suicide theory. There was a recent article in the local paper about a group of collateral Lewis descendants who are petitioning the federal government to have Lewis’s body exhumed and a forensic investigation performed on whatever remains, er, remain. Lewis’s grave lies inside the boundaries of a national park, and so far the government seems less than keen on allowing poor Lewis to be dug up. I can’t really blame them, I suppose – don’t want to encourage all the distasteful furor and so forth. Of course, it’s already kind of a circus. Maybe they should just give up and hire Geraldo to come and preside over the exhumation. Of course, then they’re sure to open up the coffin and find nothing but a bunch of buttons. Perhaps some whisky bottles. Anyway, tune in next week, or whenever I get the chance, for my humble opinion on what happened to Meriwether Lewis, based on superficial reading and no subject expertise whatsoever! The Jefferson Library recently purchased The Great Decision: Jefferson, Adams, Marshall, and the Battle for the Supreme Court by Cliff Sloan and David McKean. It presents complex legality in a easy style for all readers. The book also sheds light on how the Supreme Court really was not seen as an equal to Congress and the Presidency until this case. We take judicial review for granted now, but this book gives us a glimpse in time before it.